If you hold a leaf up to the light, you can observe that tiny vessels radiate across its surface, connecting to the stem at its center. Plants turn sunlight into sugar in their leaves, while their roots extract water and minerals from the soil. But these valuable products must be transported throughout the plant in order for it to survive. 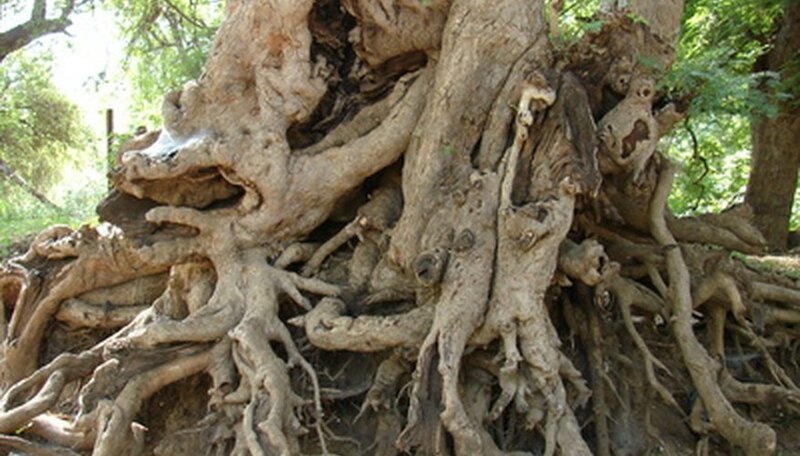 All but the most primitive plants have developed vascular systems to accomplish this purpose. Five hundred million years ago, plants originated as algae, simple aquatic plants that produce energy through photosynthesis. Because the whole plant was in contact with the water and each could draw what it needed from its surroundings, algae lacked stems and roots and had no need for a vascular system. As plants began to migrate onto land, they developed adaptations that allowed them to survive the challenges of a terrestrial environment. The earliest land plants, the mosses, began to develop stems and roots, though they still lacked vascular tissue and, therefore, had to remain small. Club mosses, horsetails and ferns were the first plants to develop vascular systems. Because these plants were larger, they needed vascular systems to conduct nutrients between distant roots and leaves. 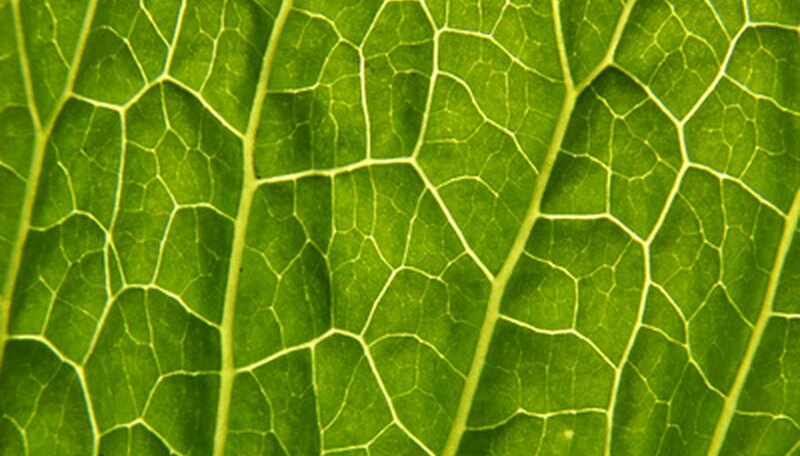 There are two types of vascular tissue contained within the veins of a leaf, xylem and phloem, which conduct nutrients in different directions within the plant. As Harvard biology professor John W. Kimball points out, cells within the leaves are generally no more than two cells away from a vein that can carry away the products of photosynthesis and provide them with water and minerals needed to carry out metabolic processes. Xylem is tough, woody tissue that transports water and minerals from the roots of the plant to the stem and leaves. Flowering plants develop xylem vessels, cylindrical cells stacked end-to-end. When the plant matures, the ends of the cells disintegrate and the cell contents die, leaving long non-living tubes. The xylem of ferns and other nonflowering plants is constructed from tracheids, tapered cells with perforated ends, allowing contents to flow between them and from the plant's roots to its leaves. Xylem tissue is nonliving, so water moves from bottom to the top of the plant using mechanical methods. Although how the xylem works isn't perfectly understood, two mechanisms seem to be involved. Leaves constantly lose water through a process called transpiration. As water evaporates from the leaves, more water is pulled into the xylem and up the plant. This process is aided by a property of water called cohesion. Because water molecules naturally stick together, they hold tight to each other as they are pulled up the plant, reducing the force needed to draw water from the roots and allowing water to reach the tops of tall trees. Phloem cells transport organic molecules and sugars created through photosynthesis in the leaves throughout the rest of the plant. Unlike xylem, phloem cells are living tissue. While xylem occurs throughout the stem--the rings observed on tree stumps are created by xylem--phloem occurs only on the outside, which explains why removing a band of bark around a tree will eventually kill the tree. Phloem cells move nutrients both up and down the plant. Phloem relies on a system called active transport followed by water pressure that moves nutrients through as much as one yard of phloem per hour. Cells called companion cells first pick up sugar molecules, which flow into sieve tubes, drawing water along with them. The water presses the nutrients through the phloem and, when it reaches a point where nutrient concentrations are low, it flows from the phloem and into the cells where it is needed. Why Are Chloroplasts So Important? What Are the Four Phyla of the Plant Kingdom? What Makes Plants Grow Towards the Sun? How is the Leaf Adapted for Photosynthesis? What Substances Are Produced by Photosynthesis? What Do Plants Need for Photosynthesis? How Do Plants Get Sunlight, Water & Air? What Are the Functions of the Endodermis of a Root?